Author Andrew Freed’s Newly Released “How To Forgive by Faith” Guides Readers to Forgiveness with the Power of Faith. “How To Forgive by Faith” from Christian Faith Publishing author Andrew Freed teaches readers how to confront the offensives of others and learn to forgive their trespasses. Through the power of faith, readers will learn to forgive even the most egregious of offensives committed against them. “How To Forgive by Faith”: a guide to the power of forgiveness through faith. “How To Forgive by Faith” is the creation of published author, Andrew Freed. Andrew Freed is a native of Cleveland, Ohio. After serving his country for twenty-one years in the military, he has dedicated his life to guiding people through the struggles of living by teaching sound biblical principles for success. As a Minister of the Gospel, Andrew serves as a teacher in his local church as well as a mentor and spiritual adviser to incarcerated men. As a life coach and speaker, he conducts many seminars dealing with forgiveness, finances, purpose, successful living, and much more. 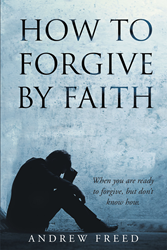 Published by Christian Faith Publishing, Andrew Freed’s new book liberates readers with the power of forgiveness. “How to Forgive by Faith” was written to help those who know they should and want to forgive, but cannot. Sooner or later, everyone is going to be offended by someone else. Sometimes, the trespass is so hurtful that it becomes seemingly impossible to overlook and forgive. Through the power of faith, however, anyone can learn forgive even the most egregious offensives. “How to Forgive by Faith” explains the nature of offense and the trap of holding onto them. Author Andrew Freed then guides the reader through the process of using faith to release even the most painful offenses. In a four-step process, he uses the Word of God to break the “unforgiven” mindset and walk readers to emotional freedom. From there, Andrew Freed teaches readers how to guard their heart to prevent future offenses from taking root. View a synopsis of “How To Forgive by Faith” on YouTube. Consumers can purchase“How To Forgive by Faith” at traditional brick & mortar bookstores, or online at Amazon.com, Apple iTunes store, Kobo or Barnes and Noble. For additional information or inquiries about “How To Forgive by Faith”, contact the Christian Faith Publishing media department at 866-554-0919.